SacAnime VIP ticket holders will be let in 30 minutes earlier then General Admission tickets. SacAnime Winter 2016 Pre-Registration tickets are $36. Heading eastbound on US Highway 50 from Sacramento towards the Sierra Mountains, you see a transition in the landscape as you cross the El Dorado County line. The lovely and welcoming community of El Dorado Hills is situated at the base of the golden foothills, just below the snowline. The Historical Crest Theater in Sacramento is showing Howl’s Moving Castle this August 13th, 2016 and I and several other artists will be in the lobby displaying our art which is also available for purchase. If you love everything Studio Ghibli why not come out and watch it in 35mm!? A wonderful yearly Convention featuring Toys and Art! Joanna Mendoza (@joannalovesart) and I are teaming up and running a booth together so come check us out!! Pabkins is back for her second year at the Folsom Christmas Arts and Craft Fair! BOOTH # will be updated here once I have that information. SacAnime Winter 2017 Pre-Registration tickets are $35. 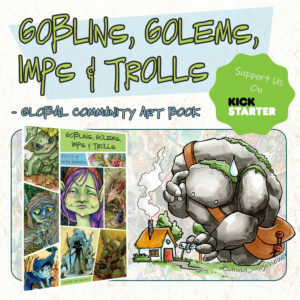 Nov 1-30th 2018, order your copy of Goblins, Golems, Imps & Trolls! 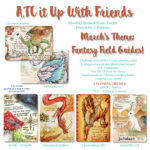 The 1st book in a series of artbooks collecting the works of artists all around the world that take part in the the ATC It Up with Friends art community as well as amazing guest artists! Pledging to the campaign will earn you perks that will have very limited quantities after the campaign. So if you want a copy and goodies its a good idea to pledge!